The purpose of Documents section in Customer profile is to store all important documents for every customer (agreements, additional agreements, certificates or manually made invoices etc). This documents will be available for customers use in Customer portal. Documents can be uploaded in any format you will choose or generated with the help of templates. How to upload a document to Splynx. To upload a document in Spynx click on on the top right corner and window "Upload file" will appear. 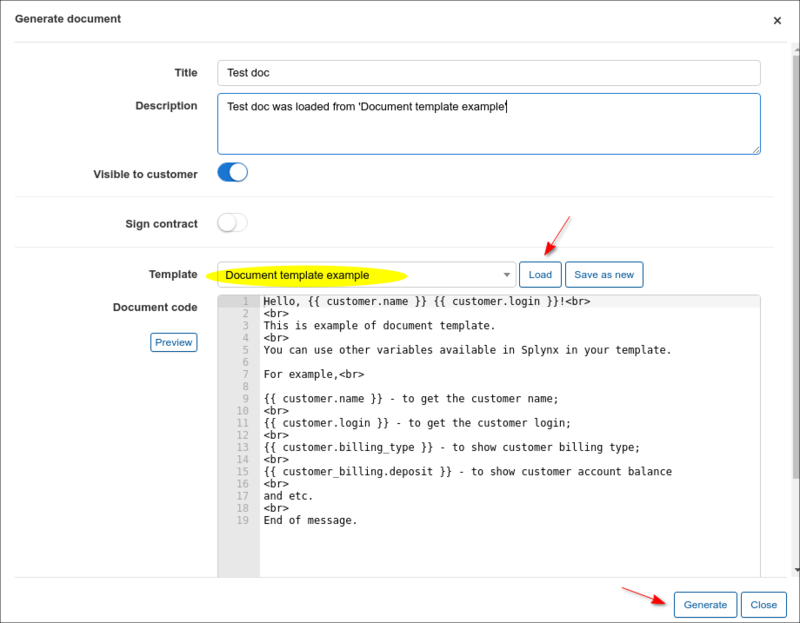 Here you can write the Title of the document, its Description (optionally) and choose if you'd like this document to be visible to a customer by turning this option on/off. Then click on File and choose the document to be uploaded. A soon as file will be uploaded it will also appear in a list of Documents. 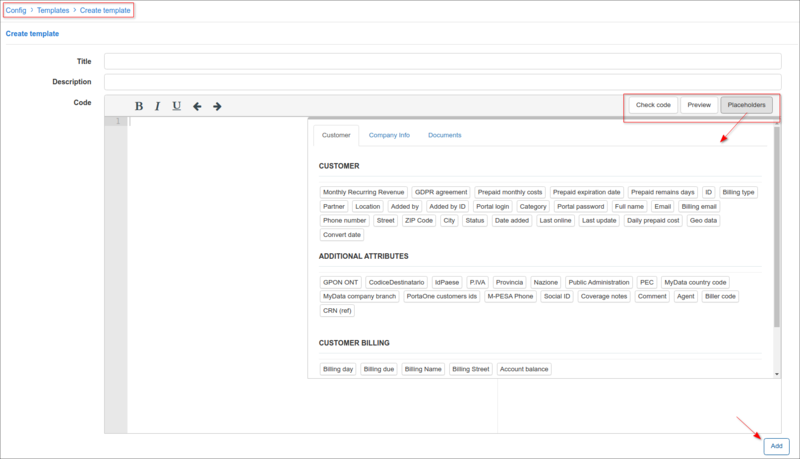 In Operations column of the table will be additional options of using this file, such as Edit , View , Download , Send to a customer and Delete . Once file had been uploaded it will also appear in Customer portal if option Visible by customer was turned on. Customer will find it in Documents section. Customer can download and view the file from here by clicking on Download icon on the right side of the table. How to generate document in Splynx. Another way to have files in Documents section is by generating them. To generate a document in Splynx click on on the top right corner and the window "Generate document" will appear. Here you will write a Title of document, its description (optionally) and choose if you'd like the document to be visible to a customer. It is possible to simply type it in the text area window and then click on Generate or Save as a new template (option above the text area). There are here text formatting and editing tools, where you can not only choose a size of the letters, font or colour of the text but also insert the image or URL link, or print the document. You can also see the Preview of the document before generating by clicking on a Preview option on the left side of the text area. As soon as document will be generated it will appear in the list of documents in a table. It is possible to use a Template to create a document by clicking on a Template window, choosing a Template and then clicking on option. Write a Title of the document, make it visible to a customer (optional) and then click on Generate. It will appear in the list of documents in a table and in a Customer portal as well, where customer will be able to download it and read. Below is an example of the documents list on a Customer portal for a particular customer. By clicking on a Type option on the top right corner and you can check all templates you've already have in each category such as Customer portal, Invoice PDF, Mail, SMS, Documents, Cards, Payment calendars. To create a new template choose a type of template first Document and then click on option. A window "Create template" will appear where you will write the Title, Description (optionally) and a code for the template. You can also edit existing template or delete it by clicking on options and in Operations column of the table.